When I started this blog (first over at MySpace and later moving it here to Blogger) some years ago, I wasn't looking for a following. I was just keeping an online journal for myself and for Collin. I'd never been good at that sort of thing, but after watching my mother slip away from us, the result of multiple strokes, watching her memory deteriorate until she no longer recognized either of us, I suddenly wanted to record my memories in case I ended up the same way--unable to remember important things from my life, from my parents' lives. I wanted Collin to be able to come here and share those memories, if he chose. I do have an author blog over at Wordpress--I didn't want a website, just something simple I could do myself to post information about upcoming books and other author-related stuff. Check out Beishir Books sometime, if you haven't already. When I started having memory issues, I was convinced I was headed down the road to dementia...or Alzheimers. 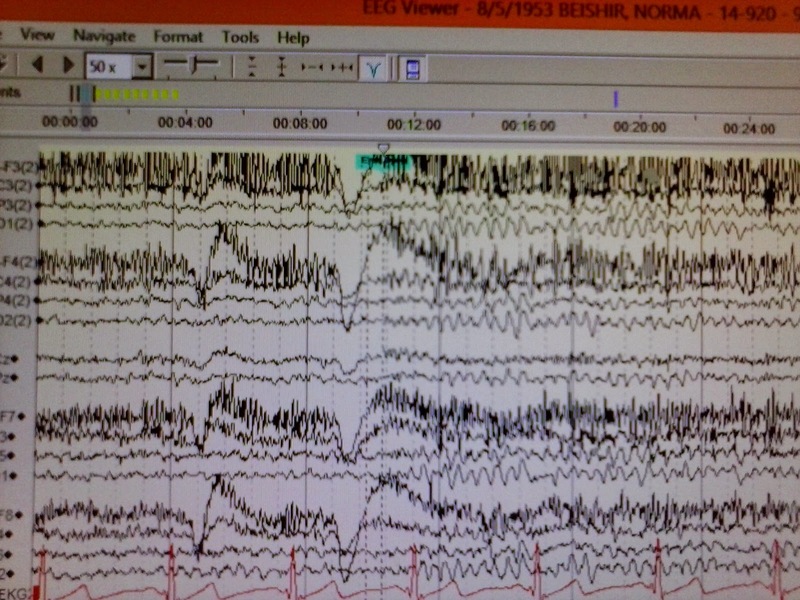 It was a relief when my neurologist, after ordering an EEG and an MRI, assured me that I'm not even close to that. My brain--please, no jokes about that wide, vacant space inside my skull. I'm told that's "normal." 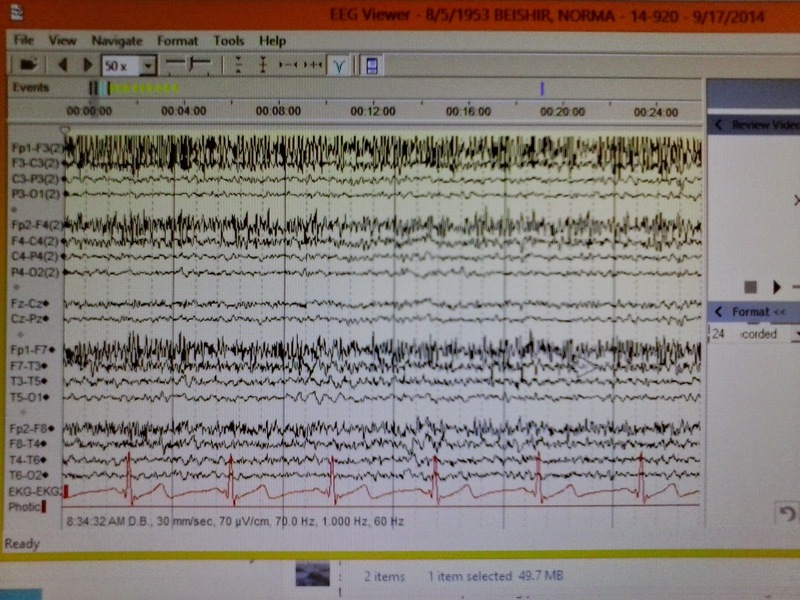 My EEG--William (Kendall) says it looks like a seismograph of the San Andreas faultline! However, in the past couple of weeks, I've done two posts that were writing-related, and the responses have been overwhelming. So I'm thinking, maybe I do have something to say that might matter to someone. Maybe a weekly writing-related post here and at Beishir Books might prove informative (or at the very least, give you all a good laugh!). If it's helpful to even one person, I'm good with that. Because of my brain issues, I've had to make some adjustments in the way I work. It takes longer. I have to use an outline now. I can't set deadlines for myself. There are good days and bad days. But I'm still in the game, and if anyone else has these issues, maybe I can help there as well. Whatever you do, have fun with it. And yeah, shocking who you picked first. But excellent choice, indeed. PS: What? I don't get to hear the meatloaf song? So not fair. Keep that meatloaf burning, meatloaf! Soon we'll be needing stomach pumps! Chew it up, spit it out, meatloaf! Oh, so that's what the meatloaf song was about! It's so great. The meatloaf song. We're trying to figure out how to do that. We've done other songs, too, so we'll see. Good thing it looks like the San Andreas fault because otherwise you'd have flatlined. You have great advice Norma. God knows I need all the help I can get. Yes, considering the alternative, better to be too active than not active at all! You can only work at your own pace, so when you've got bad days, you can just do something else. 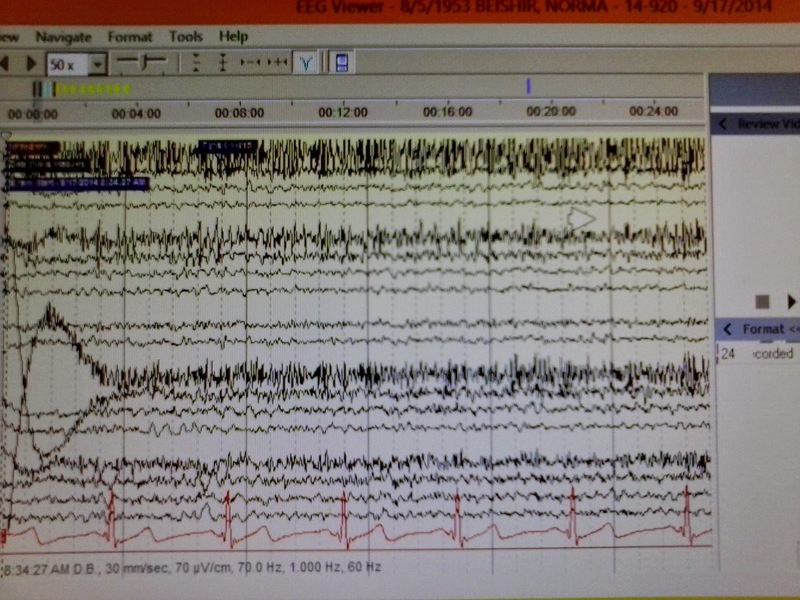 Yes, it does look like something a seismologist would like to have a look at! It took me a while to accept that, but I finally have. hahahahaahhahahaha... have fun, write whatever you want God knows I will read it ! And just who is this William Kendell that you have picked first ? Meatloaf song why don't I know about the meatloaf song ? p.s. I am thinking of moving to either Montana, Idaho or Canada. Oh, my...are we going to have to actually record the Meatloaf song? I did post the lyrics in response to Ivy asking the same question. The three options are all too cold! Yes I wrote that comment before you posted the stong ! Yes but the two very cold states have the lowest amounts of illegals on welfare. Arizona just got kicked in the gut with El Presidente" Obama newest ruling. I will do a wrap up on the non truths of his speech and how it impacts Arizona, and your state too. I think you'll not like the cold, either. Yikes. 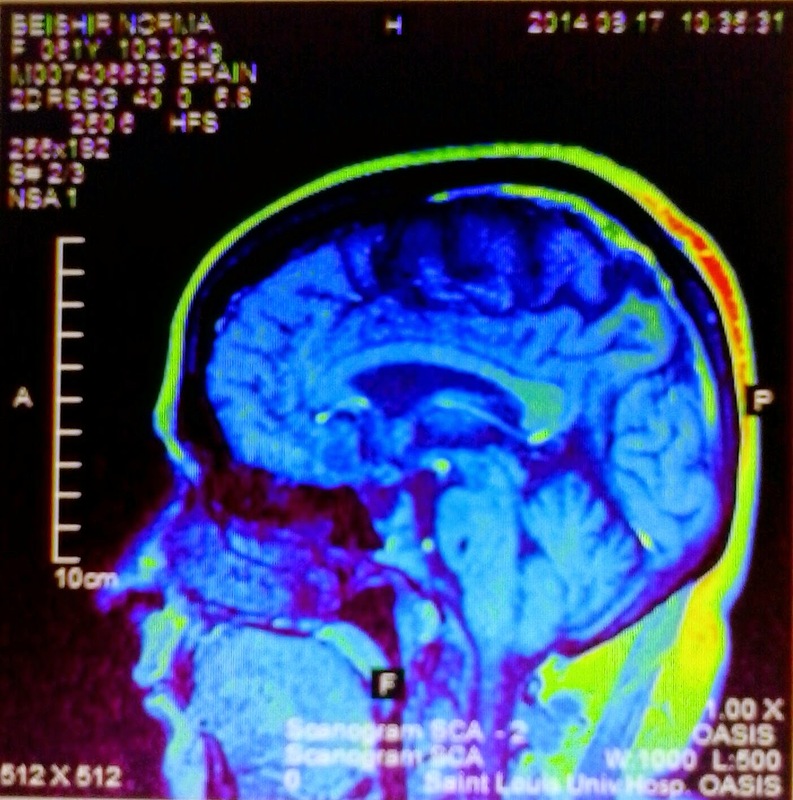 Your brain image looks fine to me. But then I've never seen a brain image before. As for issues, I've never been able to remember anything and it takes me forever to write a paragraph. Should I get tested? William???? You picked William? How can he have time to do your blog when he's got umpteen other things going!? Your advice is always welcomed. I really don't know how you are going to be able to pick from all the writers you know for the other interviews. If I had to guess who the first one would be, I would have said William. Just a hunch. I'll probably just ask whoever has something to promote at the time. Or ask for volunteers! Glad your brain is normal. I'm slow going as well. Mine is about energy and pain. 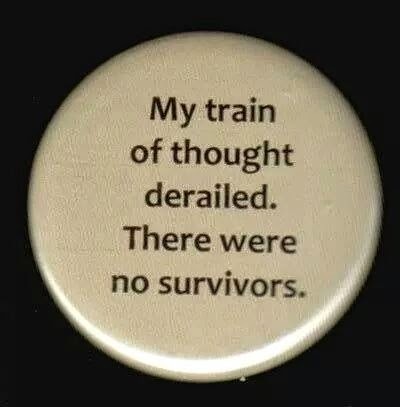 It's about as normal as a writer's brain can be. Take care of yourself. I know you have a lot to deal with right now. Norma, great post! And you have a lot of wisdom that we would like to hear. Thanks! Wisdom...now there's a word that's never been used in the same sentence as my name before, Lena! "Because of my brain issues, I've had to make some adjustments in the way I work. It takes longer. I have to use an outline now. I can't set deadlines for myself. There are good days and bad days. But I'm still in the game"
Get out of my brain! Stop writing my blog posts! Probably why I read your blog! I feel so misunderstood so much of the time - it's nice to find mentors who've struggled with non-18-yo brain. The key phrase is: "1. There's no one size fits all formula for writing"
Once a writer recognizes this, the writer's advice is far more nuanced and general. The number of books on writing I've read which basically say, "this is the only way to write," is legion. Their advice is often still useful, but it is full of landmines for the unwary and inexperienced - and that is who reads them (me, before I got wiser). Do, please - pontificate on anything that strikes your fancy. I, for one, will read. 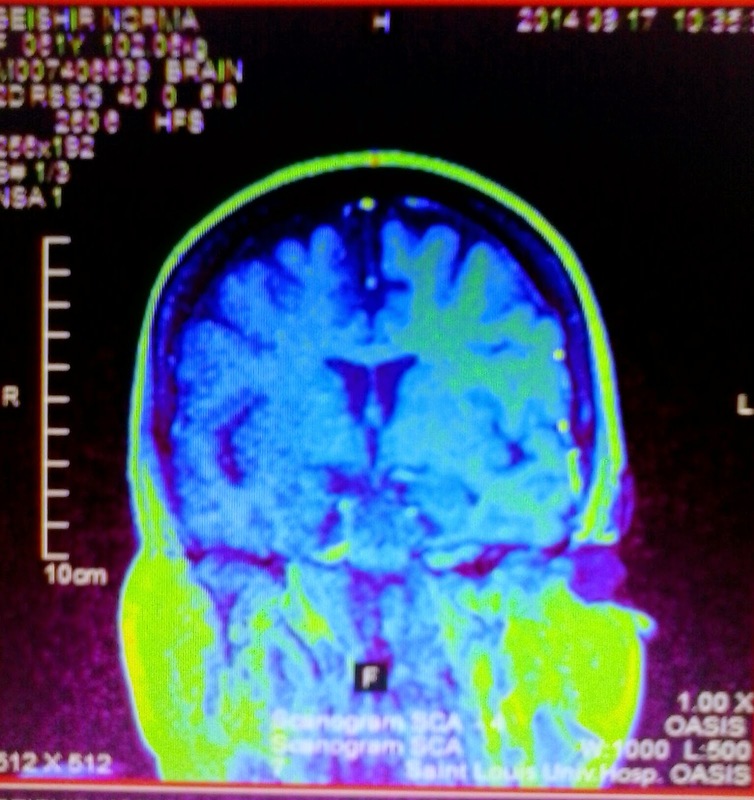 Alicia--it looks like our gray matter really IS gray! I think it was Stephen King who, in his memoir On Writing, said "Most books on writing are crap." It's true. There's no formula that works for everyone. If there were, all of us would be on the bestseller lists! I thought about just doing a profile on him, but then he can't defend himself. And just so everyone knows, these profiles and interviews won't just be with novelists. Bloggers and photobloggers are fair game, too! I was planning to draw something in if my skull was found to be empty! I love this idea! And I am thankful that the tests came back with good results. Glad you like it, Hilary--since you're on my list for Profiles in Creativity!